I was kinda anxious all day while at work thinking about tonight's Silver Beaver Award Dinner. I've been waiting for this moment for quite some time now... in fact 17 years! 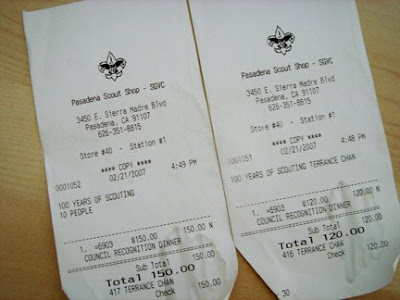 Since I didn't get a chance to earn my Eagle Scout Award as a child, I was determined to some day earn my ranks as an adult scouter. The Silver Beaver is the highest honor bestowed to a scouter in the Council level. I had the distinct honor of earning the District Award of Merit back in 1996... yes, 11 years ago! I was just a young pub learning the ropes of being a Scoutmaster. That was a pleasant surprise as I was not informed prior to attending the district dinner. All week I've been running around trying to get my new uniform in order... with all the patches and knots all in place. Lan helped me get some of my ribbons from the LA Scout Shop which is temporarily relocated to the basement of her building at Squire Sanders and Dempsy. I reserved 2 tables and prepaid it with my own money as I want to share this special moment with not only Lan, but my whole family. My mom and dad will attend my first scouting event and that is the biggest night of my scouting career. My business partners, Brian and Allen, were also there to support me and photograph the event. Chris also came but his girlfriend couldn't make it. Also, one of my scout from my Rose Parade Troop 2005 came as well. Incidentally, I included him in my montage photos. Although, I wish they didn't dim the lights so much to show the PowerPoint slideshow, because it was difficult to photograph and videotape the actual ceremony of award presentation and wearing the ribbon. I was also mis-informed that I could only take one person on stage with me during the presentation. I of course chose my mom as she did more for me than anyone on this earth. Unfortunately, I had to do it without my father. Actually, he could've come up with us but he couldn't sit on stage. Here are some of the photos of the even tonight. Thanks for sharing my special evening. It really means a lot to me to have all my family, business partners and friends there.